Dendritic cells (DCs) are key players in the delicate balance of inflammation and regulation that characterizes successful immune function. Faced with inflammatory stimuli such as foreign Ag or a host of danger signals, DCs undergo maturation and activation, and through costimulatory and cytokine signaling, then drive T cell activation, proliferation, and aggressive effector responses. In contrast, in the steady-state, DCs play a central role in the maintenance of peripheral tolerance (1) by promoting the development and stability of induced regulatory T cells (iTregs) (2–4). The critical nature of this role is underpinned by the observation that DC deficiency triggers a progressive myeloproliferative disorder characterized by lymphocyte hyperproliferation (5) and the spontaneous development of fatal autoimmunity (6). As the role of DCs in tailoring immune responses is increasingly understood, they have emerged as an attractive target for immunotherapy. Modulation of DC function to promote regulatory, protolerogenic responses holds the potential to improve outcomes in a variety of immune-mediated diseases, from allograft rejection to autoimmunity. The T cell Ig mucin (TIM) family of genes encode type I glycoproteins, with a common Ig V-like domain, mucin-like domain, a single transmembrane domain, and a cytoplasmic region (7). This novel family of costimulatory molecules is critical in directing Th cell activation and differentiation (8–10). TIM-4 is expressed solely on APCs, particularly macrophages and CD11c+ DCs (11). TIM-4 is expressed on a small population of splenic DCs and is upregulated upon DC activation. TIM-1 and TIM-4 have been described as a natural ligand–receptor pair (11). However, TIM-4 is also capable of binding to naive CD4+ T cells, which do not express TIM-1 (12), indicating the presence of an alternative, as yet unidentified receptor. The true effect of TIM-4 costimulation on T cell activation in vivo remains unclear, and in vitro studies using TIM-4 Ig fusion proteins have yielded conflicting results. One group has reported that TIM-4 signaling causes increased proliferation of activated T cells, whereas using naive T cells, others have observed reduced proliferation (11–14). TIM-4 also acts as a phosphatidylserine (PS) receptor, binding and mediating engulfment of apoptotic bodies (15–19). Efficient clearance of dying cells is an essential mechanism for the maintenance of self-tolerance (20, 21) and TIM-4−/− mice demonstrate a tendency to autoimmunity, thought to be secondary to defects in this process (17). Our current understanding of the activity of TIM-4 consists of several postulated functions and binding partners, but its effects on T cell differentiation and tolerance induction in vivo remain unclear. In this study, we demonstrate that through blockade of DC-expressed TIM-4, T cell differentiation can be redirected to induce generation of potent, functionally suppressive iTregs. In a stringent skin transplant model, in vivo blockade of TIM-4 leads to a 3-fold prolongation in graft survival with reduction in T effector responses and a protolerogenic shift in T cell response. This effect is critically dependent on the de novo induction of regulatory T cells (Tregs) from naive CD4+25− T cells in vivo. Six- to 8-wk-old wild-type (WT) C57BL/6, IL4−/−, STAT6−/−, bm12, B6.RAG−/−, and Scurfy mice were purchased from The Jackson Laboratory. B6 Foxp3-GFPreporter and ABMtg.Foxp3-GFPreporter mice were generated and maintained as a breeding colony in our facility. B6.TIM4 knockout (B6.TIM4KO) mice were a generous gift from Dr. Wenjun Ouyang (19). Mice were maintained in accordance with Harvard Medical School and National Institutes of Health Animal Care guidelines. Skin transplantation was performed as previously described (22) and was scored as rejected when no viable graft tissue remained. Expression vectors for TIM-4–Ig were generated by linking the extracellular domains of Tim-4 (aa 1–288) to the Fc portion of mouse IgG2a in the pcDNA3.1 vector. TIM-4–Ig proteins were then produced by transfection of each vector into HEK293T cells (23). Anti–TIM-4 mAbs (RMT4-53 and RMT4-54, rat IgG2bk) were generated by immunizing Sprague Dawley rats with TIM-4-Ig and fusing lymph node (LN) cells with P3U1 myeloma cells; specificity was assessed by screening the binding to TIM-4/NRK cells, but not parental NRK cells. RMT4-53 reacted with TIM-4/NRK cells, but not with parental NRK or other transfected TIM family (TIM-1 B6/NRK, TIM-1 BALB/NRK, TIM-2/NRK, TIM-3 B6/NRK, TIM-3 BALB/NRK) cells. Single-cell suspensions were made by mechanical dissociation of spleens and subsequent RBC lysis with ACK buffer (Invitrogen). Naive CD4+CD25− T cells (>90% purity) were isolated using the CD4+ T cell isolation kit II and further selected for the CD25− population using CD25 microbeads (Miltenyi Biotec). Given the paucity of splenic DCs, Flt3L-generated DCs were used. A total of 8 × 106 Flt-3L hybridoma cells (24) was injected s.c. and spleens were harvested after 14 d. DCs were then isolated using CD11c microbeads (>90% purity) and allowed to spontaneously mature overnight. Fluorochrome-labeled mAbs were purchased from BD Pharmingen with the exception of TIM-4 (RMT4-54 clone; eBioscience). Intracellular Foxp3, Gata3, and cytokine staining were performed according to manufacturer’s protocol (BD Pharmingen). Flow cytometric cell sorting was carried out using FACSAria, and flow cytometric data were acquired on a FACSCalibur and analyzed using FlowJo software (Tree Star). Purified DCs were activated for 10 h in the presence of TLR activating stimuli, including CpG-containing oligodeoxynucleotide 1668 (5 μg/ml; Invivogen; TLR9), LPS (1 μg/ml; Sigma-Aldrich; TLR4), polyinosine:cytosine (10 μg/ml; Sigma-Aldrich; TLR3), zymosan (100 μg/ml; Invivogen; TLR2), or medium alone. Cells were then resuspended, blocked with Fc block, and stained for TIM-4 PE or isotype control or used in iTreg conversion assays. CD4+CD25− cells were cocultured with CD11c+ DCs at a ratio of 4:1 with 4 μg/ml plate-bound anti-CD3 (17A2; eBioscience) and varying doses of TGF-β (R&D Systems). After 3.5 d, T cells were stained for CD4, CD25, and Foxp3. Culture supernatants were assessed for cytokine production by Luminex (Millipore) or TGF-β production by ELISA (eBioscience). In some experiments, instead of CD11c+ DCs, CD4+CD25− cells were stimulated with anti-CD3 and soluble anti-CD28 (2 μg/ml, clone 37.51; eBioscience), CD3− splenic APCs, or APCs depleted of DCs using CD11c microbeads. In other experiments, rIL-4 (Peprotech) or neutralizing anti–IL-4 mAb (BD Pharmingen) was added to cell culture. STAT6 activation was assessed at various time points after DC–T cell coculture by intracellular staining with anti–phospho-STAT6 (pY641), according to the manufacturer’s protocol (BD Phosflow). In brief, cells were fixed, permeabilized with Perm buffer III, blocked with Fc block Ab, and then stained with fluorochrome-conjugated CD3, CD4, CD11c, and phospho-STAT6 Abs. The phospho-STAT6+ population was identified by comparison with samples stained with isotype controls. Activation of the principal components of different intracellular pathways (STAT3, STAT5A/B, STAT6, P38, IκBα, P70 S6 kinase, Erk MAPK1/2, JNK, and CREB) was assessed in the protein extracts of cultured cells using the Luminex fluorescence-bead–based Ab sandwich immunoassay (Millipore). RNA was extracted from the cell lysates after 48-h culture using the RNeasy Plus Mini Kit (Qiagen). After RT reaction using Superscript III Reverse Transcriptase (Invitrogen), the resulting cDNA was used in a real-time PCR using TaqMan Universal PCR Mastermix and primers for GATA3, Foxp3, and GAPDH (Applied Biosystems). ABM transgenic (tg) experiments were performed to investigate the influence of anti–TIM-4 on the fate of allospecific T cells. tg CD4+ T cells from ABM TCR-tg mice express a TCR with defined specificity against the bm12 Ag (22). These mice were then crossed with GFP-labeled Foxp3reporter mice to generate GFP-traceable allospecific Tregs. A total of 1 × 106 ABMtg GFP− CD4+ tg T cells was adoptively transferred into B6 Thy1.1+ recipients of a bm12 skin graft. Recipients were then treated with RMT4-53 or control Ig (500 μg i.p. on day 0; 250 μg on days 2, 4, 6). On day 7, splenocytes and draining LNs were assessed for allospecific Thy1.2+ cells by flow cytometry. ABMtg CD4+CD25−GFP− cells were cultured with CD11c+ DCs, 1 ng/ml TGF-β, and RMT4-53 or control IgG. iTregs were isolated by flow sorting for Foxp3+GFP+ cells on day 4. iTregs were then added to an MLC of skin-sensitized ABMtg responder cells stimulated with irradiated allogeneic bm12 splenocytes, at varying ratios. Suppression of alloreactive T cell proliferation was determined by [3H]thymidine incorporation. To assess the in vivo function of iTregs, we used CD4+25− T cells from B6 Foxp3GFPreporter mice in an iTreg conversion culture as described earlier. iTregs induced in the presence (RMT iTregs) or absence (control iTregs) of TIM-4 blockade were then isolated by flow sorting for GFP expression. A total of 2 × 104 B6 CD4+25− T cells was i.v. injected either alone or with 8 × 104 RMT or control iTregs into B6 RAG−/− recipients of a bm12 skin transplant, and graft survival was assessed. To evaluate the effect of anti–TIM-4 on allograft survival, 2 × 104 B6 CD4+25− T cells were i.v. injected into B6 RAG−/− recipients of a bm12 skin transplant and treated with RMT4-53 or control Ig (500 μg i.p. on day 0, 250 μg on days 2, 4, 6, 8, and 10). In other experiments, 12 × 104 B6 scurfy CD4+25− T cells were transferred at the time of transplantation. Recipients were then treated with RMT4-53 or control Ig per protocol. Statistical analysis was performed using the paired Student t test with GraphPad Prism 4 software. Data are expressed as mean ± SEM; *p < 0.05, **p < 0.01, ***p < 0.001. Graft survival was assessed by Kaplan–Meier method, and statistical differences were calculated with the log rank test. The interaction of TIM-4 with TIM-1 expressed on activated CD4+ cells has been shown to promote T cell proliferation and T effector cell differentiation (8, 11, 14). However, TIM-4 has a bimodal effect on T cell activation, and has been shown to also bind to naive CD4+ T cells and inhibit their activation (12). To investigate the role of TIM-4 in directing CD4+ T cell differentiation, we generated two anti–TIM-4 Abs as described earlier. In our preliminary experiments, we found no functional differences between the two Abs, RMT4-53 and RMT4-54, and therefore used RMT4-53 for the remaining studies presented. 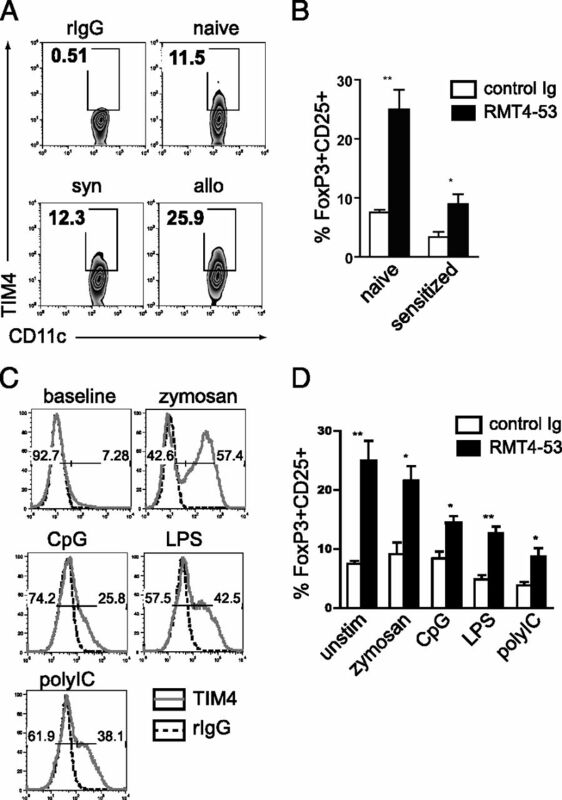 RMT4-53 has no interactions with other TIM family members and is capable of blocking TIM-4–Fc binding to CD4+ T cells. In keeping with prior studies, blockade of DC-expressed TIM-4 by RMT4-53 inhibited proliferation of activated CD4+ T cells (data not shown). Incubation with anti–TIM-4 to DCs alone does not alter their costimulatory molecule expression (CD40, CD80, CD86, MHC class II expression; data not shown), cytokine/chemokine production, or capacity to phagocytose apoptotic cells (Supplemental Fig. 1A, 1B). To investigate the effect of TIM-4 on CD4+ T cell differentiation, we incubated 1 × 106 naive CD4+25− T cells with anti-CD3 and 2.5 × 105 syngeneic Flt3L-generated CD11c+ DCs under Th0 conditions. Addition of anti–TIM-4, RMT4-53, inhibited the production of typical Th2 cytokines (Fig. 1A), whereas TGF-β levels were enhanced (Fig. 1B). No effect was seen on IFN-γ, IL-6, or IL-17 production (Fig. 1A). Under polarizing conditions, TIM-4 blockade also inhibited Th2 differentiation but had no significant impact on Th1 polarization (data not shown). Interruption of signaling via TIM-4 on DCs promotes induction of iTregs. (A) TIM-4 blockade leads to decreased Th2 cytokines under Th0 conditions. CD4+ 25− T cells (1 × 106) were incubated with Flt3L-generated CD11c+ DCs (2.5 × 105) and anti-CD3 (4 μg/ml), in the presence of anti–TIM-4 (RMT4-53, 100 μg/ml) or control Ig. Supernatants from cell cultures were harvested at day 3.5, and cytokine concentrations were measured by Luminex assay. (B) Increased TGF-β concentration was observed with TIM-4 blockade in vitro. TGF-β was measured by ELISA of supernatants taken on day 2 from coculture of CD4+ 25− T cells incubated with CD11c+ DCs and anti-CD3, in the presence of anti–TIM-4 or control Ig. (C) TIM-4 blockade promotes Treg induction in vitro. Representative flow plots showing frequency of Foxp3+ CD25+ iTregs of CD4+ T cells. A total of 1 × 106 CD4+ 25− T cells was incubated for 3.5 d with Flt3L-generated CD11c+ DCs (2.5 × 105), anti-CD3 (4 μg/ml), and TGF-β (0–1 ng/ml), in the presence of anti–TIM-4 (RMT4-53, 100 μg/ml) or control Ig. (D) Frequency of Foxp3+CD25+ iTregs of CD4+ T cells activated as in (C), with varying doses of TGF-β, quantified by flow cytometry. (E) Treg induction by anti–TIM-4 is dependent on the presence of DCs. Induction of Foxp3+CD25+ iTregs from CD4+ 25− T cells activated with anti-CD3 (4 μg/ml) and either splenic APCs (splenocytes depleted of CD3+ T cells), soluble anti-CD28 (2 μg/ml), or APCs depleted of CD11c+ DCs, in the presence of 1 ng/ml TGF-β, with anti–TIM-4 (RMT4-53) or control Ig. Data are representative of at least three independent experiments, each done in triplicate. Data are expressed as mean ± SEM. *p < 0.05, **p < 0.01. Recent reports have highlighted the inhibitory effect of IL-4 on Treg induction (25, 26). In light of the finding of increased TGF-β and reduced IL-4 levels after TIM-4 blockade, we next sought to determine whether TIM-4 impacts the induction of Foxp3+ Tregs. CD4+CD25−GFP− T cells isolated from naive B6.Foxp3GFPreporter mice were cocultured with CD11c+ DCs. Under nonpolarizing conditions, iTreg conversion was minimal (1.9 ± 0.3%). The addition of RMT4-53 led to a 2-fold increase in Treg conversion (3.7 ± 0.2%; p < 0.05). The addition of exogenous, low-dose TGF-β (1 ng/ml) amplified this effect and led to a 3.5-fold increase in the percentage of Foxp3+ regulatory T cells (23.3 ± 2.7 versus 6.7 ± 0.3%, p < 0.01; Fig. 1C, 1D). Consistent with this, we found blockade of TIM-4 to also increase the absolute number of CD4+Foxp3+ cells in these cultures and enhance proliferation of the converted iTregs (Supplemental Fig. 2A). No effects were seen on the proliferation of Th1/Th2 subsets in the presence of anti–TIM-4 (data not shown). RT-PCR confirmed increased mRNA expression of Foxp3 with RMT4-53 under both Th0 and Treg polarizing conditions (data not shown). Comparable Treg conversion was seen when splenic APCs were used as stimulators, but failed to occur when DCs were replaced with either anti-CD3/anti-CD28 stimulation or APCs depleted of DCs (Fig. 1E). This indicates the critical role of splenic DCs in mediating iTreg generation through TIM-4 blockade. In the presence of low-dose TGF-β, use of DCs from B6.TIM4KO mice also led to enhanced iTreg conversion compared with WT DCs (23.5 ± 1.5 versus 7.4 ± 0.8%; p < 0.001). Although the percentage of CD4 cells that underwent conversion into Foxp3+ iTregs was similar to that seen with blockade of TIM-4 on WT DCs (Supplemental Fig. 2B), the absolute number of converted iTregs was much more pronounced (Supplemental Fig. 2C). TIM-4 is present in low levels on immature DCs (∼5–10%; Fig. 2C), and its expression is upregulated upon DC activation. Reflecting this, increased expression is seen after receipt of an allogeneic (bm12 onto B6), but not syngeneic (B6 onto B6) skin graft (Fig. 2A). Next, we sought to determine whether blockade of TIM-4 on activated, allosensitized DCs could still enhance iTreg generation. Splenic DCs were isolated from recipients of skin allografts on day 10 after transplant and cocultured with naive CD4+ cells. As anticipated, lower rates of baseline iTreg conversion were observed compared with cultures with unsensitized immature DCs, but blockade of TIM-4 on allosensitized DCs still led to augmented iTreg conversion, both in terms of percentage of CD4+ cells (9.0 ± 1.6 versus 3.3 ± 0.9%; p < 0.05; Fig. 2B) and the absolute number of Foxp3+ iTregs in the culture (2470 ± 200 versus 4390 ± 250; p < 0.01). TIM-4 expression was also upregulated when DCs were activated in vitro by a variety of TLR agonists (Fig. 2C). However, despite potent DC activation through these diverse stimuli, increased iTreg conversion was still observed after TIM-4 blockade (Fig. 2D). These data indicate that blockade of TIM-4 may be a promising mechanism to promote the generation of iTregs, even in states of DC maturation and activation. Development of iTregs after TIM-4 blockade occurs even after DC activation. (A) TIM-4 expression on naive CD11c+ splenic DCs and on day 7 after syngeneic or allogeneic skin transplant. (B) Blockade of DC TIM-4 can still significantly induce iTregs in vitro despite prior allosensitization. CD4+25− T cells were incubated with syngeneic naive or allosensitized DCs (day 10 posttransplant), anti-CD3, and 1 ng/ml TGF-β in the presence of anti–TIM-4 (RMT4-53) or control Ig. Histograms represent the proportion of CD4+ expressing Foxp3 and CD25 at day 3.5. (C) TIM-4 expression is upregulated on CD11c+ DCs after ex vivo stimulation with TLR ligands. (D) Despite DC activation by TLR ligands, blockade of TIM-4 significantly induces iTregs in vitro. Frequency of Foxp3+CD25+ cells of CD4+ T cells incubated with previously activated DCs [as in (C)], in the presence of anti–TIM-4 (RMT4-53) or control Ig. Data are representative of at least three independent experiments, each done in triplicate. Data are expressed as mean ± SEM. *p < 0.05, **p < 0.01. Differentiation of naive CD4+ T cells into the Th2 lineage is driven by IL-4–mediated STAT6 activation of the transcription factor Gata3. To determine the mechanism by which TIM-4 mediates Th2 differentiation, we measured STAT6 activation in CD4+ T cells at serial time points using phosphoflow, which allows single-cell measurement of phosphorylation events. CD4+ T cells cocultured with flow-sorted TIM-4+ DCs showed 1.5-fold greater STAT6 phosphorylation than those incubated with TIM-4− DCs (data not shown). The addition of RMT4-53 to TIM-4+ DC culture inhibited T cell STAT6 activation by 40% at 2 h and by 60% at 4 h (Fig. 3A). Nonsignificant inhibition of STAT6 phosphorylation was also seen in CD4+ T cells cultured with TIM-4− DCs after addition of RMT4-53. This is most likely due to upregulation of TIM-4 on up to 5% of previously TIM-4− DCs, which is seen in the hours after flow sorting. Phosphoflow results were confirmed by Luminex analysis of whole-cell lysates containing DC subsets and CD4+ T cells (Supplemental Fig. 3A). Phosphorylation of STAT3 and STAT5 were similar in cultures with TIM-4+ and TIM-4− DCs, and unchanged when RMT4-53 was added (Supplemental Fig. 3B, 3C). Blockade of TIM-4 promotes iTregs by suppressing Th2 differentiation through the IL-4/STAT6 pathway. (A) Blockade of TIM-4 leads to inhibition of STAT6 phosphorylation. CD11c+ DCs were flow sorted into TIM-4+ and TIM-4− populations, then incubated with CD4+ 25− T cells. STAT6 phosphorylation was assessed by phosphoflow cytometry at serial time points. Plot shows the degree of inhibition of STAT6 phosphorylation by anti–TIM-4 in each population, as compared with control Ig. (B) TIM-4 blockade decreases CD4+ Gata3 expression. Frequency of Gata3 expression in CD4+ cells activated as in (A), as measured by flow cytometry. (C) Addition of exogenous IL-4 or neutralization of IL-4 in culture impairs the ability of RMT4-53 to further promote iTregs. Frequency of Foxp3+CD25+ T cells of CD4+ T cells cocultured with CD11c+ DCs in the presence of variable doses of rIL-4 (1–10 ng/ml) or neutralizing anti–IL-4 (1–10 μg/ml) with anti–TIM-4 (RMT4-53) or control Ig. (D) No increase in iTreg conversion was seen with TIM-4 blockade when IL-4−/− or STAT6−/− CD4+ T cells are cultured with CD11c+ DCs. Frequency of Foxp3+ CD25+ iTregs induced from WT or IL-4KO or STAT6KO CD4+ T cells activated with WT DCs, anti-CD3, and TGF-β (1 ng/ml), in the presence of anti–TIM-4 (RMT4-53) or control Ig (representative flow plots). Data are representative of three independent experiments, each done in triplicate. Data are expressed as mean ± SEM. *p < 0.05, **p < 0.01. In concordance with our STAT6 findings, CD4+ T cell Gata3 expression was highest in TIM-4+ DC cultures and was significantly decreased after TIM-4 blockade (Fig. 3B). Measurement of Gata3 mRNA expression confirmed these findings (data not shown). Taken together, these data suggest that the interaction of TIM-4 with its ligand on naive CD4+ T cells leads to activation of STAT6, transcription of Gata3, and subsequent Th2 differentiation. Based on these findings, we hypothesized that the effects of TIM-4 blockade on iTreg conversion are dependent on its ability to suppress IL-4. Indeed, the addition of exogenous IL-4 promoted Th2 differentiation and overwhelmed the ability of RMT4-53 to enhance iTreg conversion, in a dose-dependent manner (Fig. 3C). Similarly, IL-4 neutralization led to an overall increase in the Foxp3+ population, consistent with previous studies (27), but prevented any additional effect of RMT4-53 (Fig. 3C). To investigate the role of IL-4 in RMT4-53–mediated iTreg generation, we repeated CD4+:DC coculture experiments using IL-4KO cells. Compared with WT, the use of IL-4KO CD4+ T cells was associated with an increased Foxp3+ population (Fig. 3D). The addition of anti–TIM-4 to cultures containing IL-4KO CD4+ T cells failed to further enhance iTreg conversion (26.5 ± 3.9 versus 30.7 ± 1.4%, p = ns; Fig. 3D). Correspondingly, the levels of STAT6 activation and Gata3 expression were much lower in IL-4KO CD4+ T cells than WT, and were similarly unaffected by the addition of anti–TIM-4 (data not shown). STAT6 signaling also inhibits iTreg generation, either directly, by binding to a noncoding DNA element upstream of the Foxp3 promoter and inhibiting its transcription (25), or indirectly, by inducing Gata3 transcription, which then directly interferes with Foxp3 transcription (26). To investigate the role of STAT6 signaling in the generation of iTregs by TIM-4 blockade, we cocultured WT DCs with either WT or STAT6KO CD4+CD25− T cells. Consistent with prior reports (28), increased iTreg conversion was seen with STAT6KO CD4+ T cells compared with WT cells under control conditions. Again, no further increase was seen after the addition of RMT4-53 to cultures containing STAT6KO CD4+ T cells (24.2 ± 1.4 versus 24.9 ± 1.3%; Fig. 3D). Collectively, these data indicate that the generation of iTregs by TIM-4 blockade is dependent on its ability to suppress the IL-4/STAT6/Gata3 pathway, thereby redirecting T cell differentiation from Th2 to iTreg phenotype. To examine the effect of TIM-4 blockade on the conversion of iTregs in vivo, we used an Ag-specific adoptive transfer model (22). In this model, ABM TCR-tg mice have CD4+ T cells expressing a TCR with defined specificity against the bm12 Ag and can be tracked by their expression of the surface marker Thy 1.2. ABMtg Foxp3 GFPrep mice further allow tracking of allospecific Foxp3+ Tregs by their expression of GFP. Thy 1.2+ alloantigen-specific CD4+ T cells were transferred into congenic Thy1.1+ B6 WT recipients of a bm12 skin graft. Recipient mice were treated with anti–TIM-4 Ab or control Ig. Seven days after transplantation, Thy1.2+ alloreactive T cells in draining LNs were examined. RMT4-53–treated mice showed a reduction in absolute numbers of allospecific Thy1.2+ T cells in both spleen (treated 21.8 × 104 ± 1.6 versus control 31.1 × 104 ± 3.0; p < 0.05) and draining LNs (18.6 × 104 ± 2.9 versus 23.2 × 104 ± 1.9; p < 0.01). Furthermore, allospecific CD44highCD62Llow effector-memory cells were markedly reduced (42.2 ± 2.2 versus 52.9 ± 3.1%; p < 0.01), and greater percentage of Foxp3+ Tregs (22.8 ± 3.3 versus 9.2 ± 1.6%; p < 0.01) was observed (Fig. 4A). A paired t test was performed to determine statistical significance. To determine whether this increase was due to enhanced conversion of iTregs in vivo, we then transferred flow-sorted Foxp3−GFP− CD4+ tg cells. Compared with controls, mice treated with anti–TIM-4 showed a 2.6-fold increase in the absolute number of tg Thy1.2+ Foxp3+ Tregs in the draining LNs (9.1 ± 1.2 versus 3.5 ± 0.9%; p < 0.01; Fig. 4B). 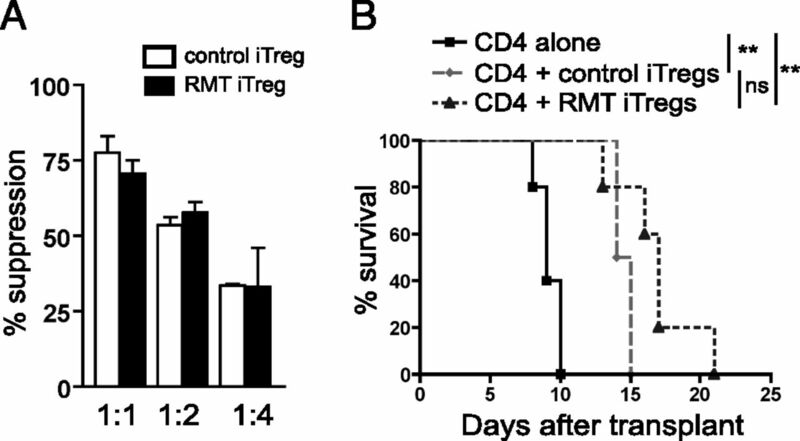 This resulted in a significantly reduced ratio of pathogenic CD4+ T effector memory cells to tolerance-promoting Tregs (1.5 ± 0.06 versus 2.8 ± 0.1; p < 0.01; Fig. 4C). These changes were associated with a 5-fold reduction in IL-4–producing allospecific CD4+ T cells (Fig. 4D). Smaller reductions were also seen in IFN-γ, possibly a result of the enhanced Treg population and IL-10 production (Fig. 4D), because in vitro blockade of TIM-4 in Th0 or Th1 polarizing conditions did not show direct inhibition of IFN-γ production (data not shown). A similar profile was observed in splenic T cells where anti–TIM-4 treatment led to a 1.4-fold increase in iTregs (17.7 ± 0.4 versus 12.4 ± 0.6%; p < 0.01). Together, these data demonstrate that in vivo blockade of TIM-4 signaling at the time of transplantation leads to allospecific iTreg conversion and suppresses the CD4+ effector response, leading to a more tolerogenic overall T cell profile. Blockade of TIM-4 promotes in vivo conversion of alloantigen-specific iTregs and suppresses CD4+ effector responses after transplantation. Adoptive transfer model: 3 × 106 CD4+ 25− Thy1.2 ABMtg cells were i.p. injected into congenic Thy1.1 B6 mice. Draining LNs were harvested on day 7 after bm12 skin transplant and treatment with anti–TIM-4 or control Ig. (A) In vivo treatment with anti–TIM-4 is associated with decreased allospecific T effector and increased allospecific Treg generation. Representative flow plots show expression of CD44 and CD62L (left panels), and Foxp3-GFP and CD25 (right panels) in Thy1.2+ alloantigen-specific tg CD4+. (B) Absolute number of CD4+ Thy1.2+ CD25+Foxp3-GFP+ cells from draining LNs of recipient mice, as determined by enumeration and flow cytometry. (C) Ratio of CD4 effector memory/Treg was determined by dividing percentage of Thy1.2+ CD4 effector memory (Thy1.2+GFP−CD44highCD62Llow) by the percentage of Thy 1.2+ Tregs (Thy1.2+CD25+GFP+) from draining LNs. (D) Treatment with anti–TIM-4 in vivo is associated with decreased IFN-γ and IL-4 and increased IL-10 production in draining LNs after skin transplantation. Frequency of cytokine-producing alloantigen-specific Thy1.2+CD4+ cells after ex vivo restimulation with PMA and ionomycin was assessed by flow cytometry. Data are from three experiments with four mice per group in each. Error bars represent SEM. A paired t test was performed to determine statistical significance. *p < 0.05, **p < 0.01. Successful induction of peripheral tolerance by iTregs relies heavily on their functionality and phenotypic fidelity (29, 30). To compare the suppressive function of iTregs induced with (RMT4-53 iTregs) or without (control iTregs) TIM-4 blockade on a per-cell basis, we used an alloantigen-specific Treg suppression assay. iTregs were first generated from naive ABMtg CD4+CD25−GFP− cells in cultures with DCs, TGF-β, and RMT4-53 or control Ig. After 4 d, iTregs were isolated by flow sorting for the Foxp3+GFP+ population. These iTregs were added in varying ratios to an MLC of bm12 skin-sensitized ABMtg responder cells stimulated with irradiated allogeneic bm12 splenocytes. Both control and RMT4-53 iTregs demonstrated similar suppression of alloreactive T cell proliferation, as determined by [3H]thymidine incorporation (Fig. 5A). 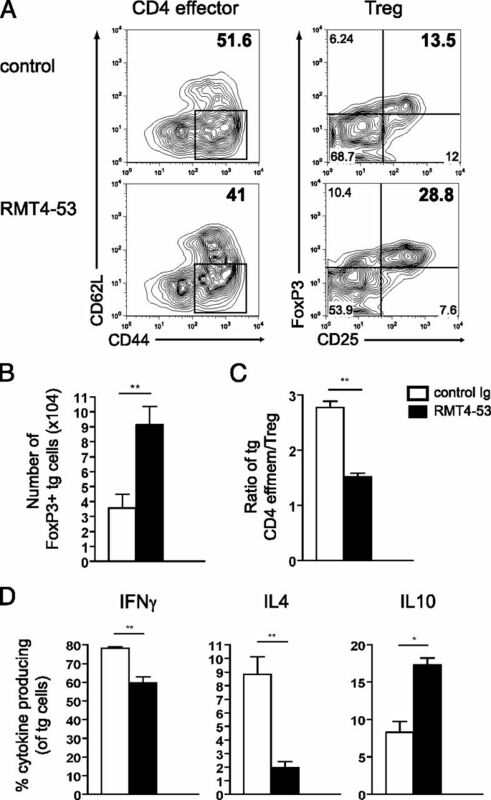 Furthermore, RMT4-53 iTregs showed a similar ability to suppress pathogenic alloreactive cytokine responses, as measured by the amount of IFN-γ production and the number of IFN-γ–producing cells (by Luminex and ELISPOT, respectively; Supplemental Fig. 4A, 4B). iTregs generated through interruption of TIM-4 signaling are functionally suppressive and prolong skin allograft survival in vivo. (A) iTregs were generated by coculturing ABMtg CD4+ Foxp3−GFP− cells with CD11c+ DCs, with 4 μg/ml anti-CD3 and 1 ng/ml TGF-β in the presence of anti–TIM-4 (RMT4-53) (RMT iTregs) or control Ig (control iTregs). Tregs were flow-sorted for Foxp3-GFP expression and added at varying ratios to MLC of irradiated allogeneic bm12 splenocytes and allosensitized ABMtg CD4+Foxp3− cells. Proliferation was assessed by [3H]thymidine incorporation. (B) Survival of bm12 skin allograft in B6 RAG−/− recipients after transfer of B6 WT CD4+CD25− cells (2 × 104) alone (MST 9 d; n = 5) or with 8 × 104 control iTregs (MST 14.5 d; n = 4) versus RMT iTregs (MST 17 d; n = 5). iTregs generated from B6 WT CD4+25− Foxp3-GFPreporter T cells cocultured with CD11c+ DCs in the presence of anti–TIM-4 (RMT iTregs) or control Ig (control iTregs) and then isolated by flow sorting for GFP expression. Data from (A) are representative of two independent experiments, each done in triplicate. Data are expressed as mean ± SEM. **p < 0.01. Emerging data have raised concerns that iTregs may not stably maintain their suppressive function in vivo, particularly in lymphopenic hosts and in inflammatory settings (29, 31). To investigate whether RMT iTregs are functionally suppressive in vivo, we used the lymphopenic environment of B6 RAG−/− recipients. iTregs were generated as described earlier from naive B6 Foxp3GFPreporter CD4+. A total of 8 × 104 flow sorted Foxp3+GFP+ cells was cotransferred with 2 × 104 CD4+CD25− WT conventional T cells into RAG−/− recipients of a bm12 skin graft. Control recipients of conventional T cells alone rejected at 9 d (n = 5; Fig. 5B), and after cotransfer of control iTregs, median graft survival time (MST) increased to 14.5 d (n = 4). Recipients of RMT4-53 iTregs showed a trend toward longer graft survival (MST 17 d; n = 5). These data indicate that iTregs induced under TIM-4 blockade demonstrate equivalent potency to control iTregs in vitro and mediate a significant prolongation of allograft survival in vivo. We next sought to assess whether treatment with RMT 4-53 could prolong graft survival through its effect on alloimmune responses. To assess the impact of TIM-4 blockade on graft survival, we transplanted bm12 skin grafts onto RAG−/− recipients receiving 2 × 104 CD4+CD25− WT cells. Treatment with anti–TIM-4 significantly prolonged graft survival (MST 28.5 d; n = 4) compared with mice treated with control Ig (MST 9 d; n = 5; p < 0.006; Fig. 6). Because RAG−/− mice lack T cells, the graft-prolonging effects of TIM-4 blockade after the transfer of CD4+CD25− cells must result either from direct suppression of CD4+ effector mechanisms, induction of iTregs (which then suppress T effector cell responses), or a combination thereof. To delineate between these possibilities, we transferred CD4+CD25− cells from Scurfy mice, which lack Foxp3 and are incapable of generating either natural Tregs (nTregs) or iTregs (32, 33), into RAG−/− skin allograft recipients. Indeed, after adoptive transfer of scurfy cells into a RAG−/− host, no change in graft survival was seen after blockade of TIM-4 (MST 18 versus 16 d; p = NS; Fig. 6), indicating that the graft prolonging effect of this therapy is critically dependent on the conversion of naive CD4+25− T cells into Foxp3+ iTregs in vivo. TIM-4 blockade leads to marked prolongation of skin allograft survival and is critically dependent on the generation of iTregs in vivo. Survival of bm12 skin allograft in B6 RAG−/− recipients after adoptive transfer of 2 × 104 B6 WT CD4+CD25− cells (black lines) or 1 × 105 B6 Scurfy CD4+CD25− cells (grey dotted lines). Recipients were treated with anti–TIM-4 or control Ig (500 μg on day 0, 250 μg on days 2, 4, 6, 8, 10). B6 WT cells: MST 28.5 d versus 9 d, p < 0.01, n = 4/5; B6 Scurfy cells: MST 18 d versus 16 d, p = NS, n = 4/5. **p < 0.01. DCs are key mediators of the balance between effector and regulatory T cell responses. In steady-state conditions, DCs play a crucial role in sustaining peripheral tolerance and iTreg maintenance (2, 3, 34). However, upon activation, DCs upregulate costimulatory and cytokine signals, and drive aggressive T cell responses. This highly efficient response, although protective against invading pathogens, can also lead to considerable morbidity, particularly in conditions such as autoimmunity and allograft rejection. Therefore, a central objective in studies of tolerance induction is the identification of targets to modulate DC function and promote the generation of regulatory T cells. In this study, we used a highly specific anti–TIM-4 Ab, RMT 4-53, and demonstrated the increased capacity of DCs to induce iTregs after blockade of TIM-4. Depletion of CD11c+ DCs from splenic APCs abrogated iTreg induction by anti–TIM-4, thus confirming the absolute requirement for DCs to mediate this effect. Furthermore, despite DC maturation and activation, blockade of TIM-4 still promotes iTreg induction from naive CD4+ cells, indicating that this mechanism is not dependent on the maintenance of an immature DC phenotype. However, blockade of TIM-4 costimulatory signals by DCs to previously allosensitized CD4+ cells may not have the same effect as on naive CD4+ cells. Under in vitro allogeneic restimulation, TIM-4 blockade does not alter cytokine production by sensitized CD4+ cells (data not shown), suggesting less dependence on TIM-4 costimulation for cytokine production after prior activation. TIM-4 has a complex role in vivo, acting both as a costimulatory molecule and a PS receptor, mediating phagocytosis of apoptotic cells (16, 35). In the published literature, different experimental models have indicated its varied effects. In studies of food allergy, enhanced TIM-4 expression on intestinal mucosal (36, 37) and bone marrow–derived DCs (38) induces intestinal allergy by promoting Th2 polarization in vivo. Administration of TIM-4 Ab inhibited these responses and restored oral tolerance (37). In contrast, mice congenitally deficient in TIM-4 experience mild features of autoimmunity, proposed to occur because of defective clearance and subsequent accumulation of apoptotic cells, leading to nonspecific immune activation (16, 17, 19). In support of this hypothesis, treatment with an anti–TIM-4 Ab, which specifically blocks phagocytosis of apoptotic cells, leads to increased T cell proliferation (15). However, in contrast with the food allergy data and further reflecting the niche-specific effects of TIM-4, tg overexpression of TIM-4 is protective against secondary T cell responses in a murine model of AHR (15). We speculate that these differences arise because of the diverse roles of TIM-4 in immune activation, leading to different effects in models where its costimulatory versus phagocytic function predominate. Furthermore, TIM-4 expression is compartmentalized, which may further contribute to the variable effects seen. In this article, we show that blockade of TIM-4 on DCs using RMT4-53 does not affect phagocytosis of apoptotic bodies by DCs (Supplemental Fig. 1B). Therefore, we believe the predominant effect of our anti–TIM-4 Ab in this model is the induction of iTregs from naive CD4 cells through interruption of DC TIM-4 costimulatory signaling. TIM-4 signaling promotes Th2 differentiation, and Th2 responses are known to profoundly inhibit peripheral Treg induction from naive CD4+ T cells. The presence of IL-4 (28), STAT6 signaling (25), and Gata3 transcription (26) can all independently interfere with Foxp3 gene transcription. In this study, we confirmed that deficiency of IL-4 and STAT6 in CD4+ T cells enhances iTreg induction. However, in the absence of these members of the canonical Th2 pathway, blockade of DC TIM-4 could not further increase the percentage of Foxp3+ Tregs, indicating that suppression of Th2 differentiation is the central mechanism of Treg induction. Furthermore, the addition of neutralizing anti–IL-4 mimics the increase in iTreg generation seen after treatment with anti–TIM-4. Taken together, these findings demonstrate that the induction of Tregs through TIM-4 blockade is an indirect phenomenon, resulting from suppression of IL-4, STAT6, and Gata3. Both nTregs and iTregs have been shown to independently contribute to peripheral tolerance (39, 40). In these studies, we have not specifically examined the effect of TIM-4 on nTreg function and cannot rule out that it may also have some effect on their function. We have demonstrated that in vitro blockade of DC TIM-4 leads to a 3.5-fold increase in iTreg conversion in the presence of low-dose TGF-β, and when adoptively transferred, these iTregs are highly potent and mediate a slight prolongation in allograft survival when compared with control iTregs. When administered in a skin transplant model, we found anti–TIM-4 treatment markedly prolongs graft survival by 3-fold (minor MHC-mismatch model using RAG−/− recipients repleted with CD4+ T cells). It also modestly extends survival in a full MHC-mismatch model (BALB/c into B6 recipients; control MST 10 d [n = 7] versus RMT4-53 MST 14 d [n = 5]; p < 0.01). Furthermore, TIM-4 blockade can synergize with tolerance-inducing CTLA4-Ig to further promote graft survival (M.Y. Yeung, unpublished observations). Using an Ag-specific adoptive transfer model, we show anti–TIM-4 treatment significantly increases allospecific LN Tregs in vivo, whereas it reduces proinflammatory CD4+ T effector cells. Analysis of cytokine production reflected this protolerogenic shift, with the most significant changes being a 5-fold decrease in LN IL-4–producing and an increase in IL-10–producing allospecific CD4+ T cells. iTreg induction by DCs occurs in the presence of TGF-β and IL-2. However, even small amounts of IL-4 are sufficient to oppose iTreg generation (28). Thus, it is likely that suppression of local, autocrine IL-4 activity, achieved by TIM-4 blockade, is sufficient to enhance iTreg generation and then lead to the change in overall T cell profile. Of note, IFN-γ production was also significantly reduced in treated recipients. We speculate this is an indirect effect, mediated by enhanced Treg numbers, as no direct effect on Th1 differentiation was observed in in vitro studies. TGF-β is a key mediator of immune regulation and tolerance. It plays a crucial role in induction of Foxp3 expression and commitment to Treg differentiation in naive CD4+. Along with promoting iTregs, it is central to induction of tolerance by donor-specific transfusion. In contrast, however, in the presence of IL-6, TGF-β promotes proinflammatory Th17 cell generation (41), and it has also been implicated in the development of chronic allograft rejection through induction of allograft fibrosis (42). Therefore, the pleiotropic effects of TGF-β render it an unsuitable therapeutic target for transplantation tolerance induction. Direct blockade of IL-4 in vivo can also promote de novo generation of iTregs (28) and in murine models of Th2-driven diseases, such as airway hypersensitivity, this therapeutic strategy has shown promising results. Despite this, therapies targeted at specific blockade of IL-4 have proved unsuccessful in early-stage clinical trials (43). Furthermore, in transplantation models of STAT6 deficiency, a decrement in long-term allograft survival has been observed (44). These findings suggest that isolated impairment of Th2 differentiation is not sufficient to promote tolerance induction in models of aggressive immunity. In contrast, TIM-4 blockade using RMT4-53 downregulates immune responses through two interlinked mechanisms. Through blocking costimulation, it leads to a reduction in T effector responses, as demonstrated in our allospecific model of transplantation. Furthermore, RMT4-53 increases the induction of Tregs, both in vitro and in vivo. Using adoptive transfer of Foxp3-deficient CD4+ cells, we have conclusively shown that the ability of naive CD4+ to convert to iTregs in vivo is the key mechanism in the induction of prolonged allograft survival observed in this stringent skin transplantation model. Importantly, blockade of TIM-4 on DCs activated by TLR agonists or prior allogeneic stimulation can also promote iTreg generation, indicating potential therapeutic applications in other disease states. This tolerogenic effect, along with its potent suppression of Th2 responses, raises the possibility that blockade of TIM-4 costimulatory signaling may also be a potential target in models such as asthma and atopy, where aggressive Th2 responses govern disease pathogenesis.
. 2002. Avoiding horror autotoxicus: the importance of dendritic cells in peripheral T cell tolerance. Proc. Natl. Acad. Sci. USA 99: 351–358.
. 2009. Feedback control of regulatory T cell homeostasis by dendritic cells in vivo. J. Exp. Med. 206: 1853–1862.
. 2005. Inducing and expanding regulatory T cell populations by foreign antigen. Nat. Immunol. 6: 1219–1227.
. 2008. CD8+ CD205+ splenic dendritic cells are specialized to induce Foxp3+ regulatory T cells. J. Immunol. 181: 6923–6933.
. 2008. Lack of conventional dendritic cells is compatible with normal development and T cell homeostasis, but causes myeloid proliferative syndrome. Immunity 29: 986–997.
. 2009. Constitutive ablation of dendritic cells breaks self-tolerance of CD4 T cells and results in spontaneous fatal autoimmunity. J. Exp. Med. 206: 549–559.
. 2009. The costimulatory role of TIM molecules. Immunol. Rev. 229: 259–270.
. 2009. Tim-1 signaling substitutes for conventional signal 1 and requires costimulation to induce T cell proliferation. J. Immunol. 182: 1379–1385.
. 2005. The TIM gene family regulates autoimmune and allergic diseases. Trends Mol. Med. 11: 362–369.
. 2006. TIM family of genes in immunity and tolerance. Adv. Immunol. 91: 227–249.
. 2005. TIM-4 is the ligand for TIM-1, and the TIM-1-TIM-4 interaction regulates T cell proliferation. Nat. Immunol. 6: 455–464.
. 2008. Bimodal regulation of T cell-mediated immune responses by TIM-4. Int. Immunol. 20: 695–708.
. 2011. Tim-4 inhibition of T-cell activation and T helper type 17 differentiation requires both the immunoglobulin V and mucin domains and occurs via the mitogen-activated protein kinase pathway. Immunology 133: 179–189.
. 2008. TIM-4 expressed on APCs induces T cell expansion and survival. J. Immunol. 180: 4706–4713.
. 2010. TIM-4, a receptor for phosphatidylserine, controls adaptive immunity by regulating the removal of antigen-specific T cells. J. Immunol. 185: 6839–6849.
. 2007. TIM-1 and TIM-4 glycoproteins bind phosphatidylserine and mediate uptake of apoptotic cells. Immunity 27: 927–940.
. 2010. T and B cell hyperactivity and autoimmunity associated with niche-specific defects in apoptotic body clearance in TIM-4-deficient mice. Proc. Natl. Acad. Sci. USA 107: 8706–8711.
. 2007. Structures of T cell immunoglobulin mucin protein 4 show a metal-Ion-dependent ligand binding site where phosphatidylserine binds. Immunity 27: 941–951.
. 2010. Phosphatidylserine receptor Tim-4 is essential for the maintenance of the homeostatic state of resident peritoneal macrophages. Proc. Natl. Acad. Sci. USA 107: 8712–8717.
. 1997. Immunosuppressive effects of apoptotic cells. Nature 390: 350–351.
. 2004. Defects in the disposal of dying cells lead to autoimmunity. Curr. Rheumatol. Rep. 6: 401–407.
. 2003. New TCR transgenic model for tracking allospecific CD4 T-cell activation and tolerance in vivo. Am. J. Transplant. 3: 1242–1250.
. 2009. Tim-3 mediates phagocytosis of apoptotic cells and cross-presentation. Blood 113: 3821–3830.
. 2004. T-cell priming by dendritic cells in lymph nodes occurs in three distinct phases. Nature 427: 154–159.
. 2008. IL-4 inhibits TGF-beta-induced Foxp3+ T cells and, together with TGF-beta, generates IL-9+ IL-10+ Foxp3(-) effector T cells. Nat. Immunol. 9: 1347–1355.
. 2007. GATA3-driven Th2 responses inhibit TGF-beta1-induced FOXP3 expression and the formation of regulatory T cells. PLoS Biol. 5: e329.
. 2008. STAT6 Inhibits TGF-beta1-mediated Foxp3 induction through direct binding to the Foxp3 promoter, which is reverted by retinoic acid receptor. J. Biol. Chem. 283: 14955–14962.
. 2009. Instability of the transcription factor Foxp3 leads to the generation of pathogenic memory T cells in vivo. Nat. Immunol. 10: 1000–1007.
. 2010. Stability of the regulatory T cell lineage in vivo. Science 329: 1667–1671.
. 2009. Plasticity of CD4(+) FoxP3(+) T cells. Curr. Opin. Immunol. 21: 281–285.
. 2001. Disruption of a new forkhead/winged-helix protein, scurfin, results in the fatal lymphoproliferative disorder of the scurfy mouse. Nat. Genet. 27: 68–73.
. 2003. Foxp3 programs the development and function of CD4+CD25+ regulatory T cells. Nat. Immunol. 4: 330–336.
. 2012. Dendritic cells ameliorate autoimmunity in the CNS by controlling the homeostasis of PD-1 receptor(+) regulatory T cells. Immunity 37: 264–275.
. 2007. Identification of Tim4 as a phosphatidylserine receptor. Nature 450: 435–439.
. 2007. Staphylococcal enterotoxin B increases TIM4 expression in human dendritic cells that drives naïve CD4 T cells to differentiate into Th2 cells. Mol. Immunol. 44: 3580–3587.
. 2007. TIM-4 expressed by mucosal dendritic cells plays a critical role in food antigen-specific Th2 differentiation and intestinal allergy. Gastroenterology 133: 1522–1533. Feng, B. S., X. Chen, S. H. He, P. Y. Zheng, J. Foster, Z. Xing, J. Bienenstock, and P. C. Yang. 2008. Disruption of T-cell immunoglobulin and mucin domain molecule (TIM)-1/TIM4 interaction as a therapeutic strategy in a dendritic cell-induced peanut allergy model. J. Allergy Clin. Immunol. 122: 55–61, 61.e1–7.
. 2011. A requisite role for induced regulatory T cells in tolerance based on expanding antigen receptor diversity. Immunity 35: 109–122.
. 2007. Natural regulatory T cells and de novo-induced regulatory T cells contribute independently to tumor-specific tolerance. J. Immunol. 178: 2155–2162.
. 2006. TGFbeta in the context of an inflammatory cytokine milieu supports de novo differentiation of IL-17-producing T cells. Immunity 24: 179–189.
. 2009. Role of T cell TGFbeta signaling and IL-17 in allograft acceptance and fibrosis associated with chronic rejection. J. Immunol. 183: 7297–7306.
. 2012. Targeting interleukin-4 in asthma: lost in translation? Am. J. Respir. Cell Mol. Biol. 47: 261–270.
. 2000. Role of STAT4 and STAT6 signaling in allograft rejection and CTLA4-Ig-mediated tolerance. J. Immunol. 165: 5580–5587.